In my humble opinion, the best snowboarding runs are in Keystone’s Outback. The first time I rode some of these trails, I was overcome with the feeling that all my years riding was just practice for runs I was doing there. This is an awesome snowboard run with trees that aren’t spaced too close for those who are still nervous. The paths between the trees can get pretty defined, so be comfortable with different snow and terrain before attempting this run. You’ll be right up against the boundary line of the ski resort, which means few people will be around. Bring a friend to ride with, and don’t expect to see many other skiers out there. One downfall of being this far out on your snowboard is that the bottom of the trail requires a leg burning ride back on some nearly flat trails. After one run you’ll quickly learn how to manage this part of the trail, so don’t let that deter you, and keep your speed up. This was the first run I took in this area of Keystone’s Outback, which is why I now love the area. The whole ride you’ll have a great view of the North Mountain, so be sure to stop and look. Bushwhacker quickly turns into more trees, but still leaves enough room for moguls to develop. This gives you more room to turn if you need but still have the feeling of being in the trees and powder that you love. Badger is a bit more open up top, but the trees compress to give you a feeling of separation from those around you and gives you some of the best snowboarding you’ll find. Don’t worry about getting lost; all paths lead down. Ride with a friend to explore all the pocket of jumps and mini-trails around the trees. This run in the Outback will take a bit more time than the others, because you’ll need to plan your path through the snow. 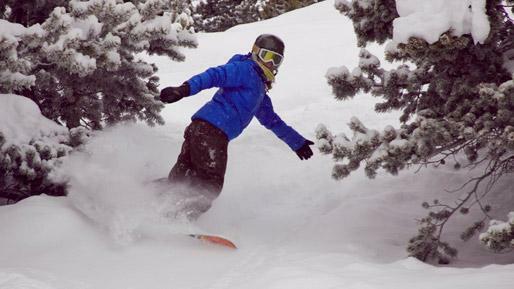 One of the best tree runs at Keystone Resort. Not too steep, but plenty of trees to work with. On the weekends there might be a few more skiers here than on the other runs listed above, but still many paths to find your own way down without feeling that you’re in a line. One reason The Griz gets more ski traffic is that the flat catwalk at the bottom is minimized — a plus for any snowboarder! I hope you enjoy these trails on your snowboard as much as I do. After you get done burning out your legs on these great snowboarding runs, head back to Dillon for a great meal….you’ve earned it!